The 2D Viewer provides interactive drawing tools which allow you to create your own polygon, polyline and point data objects. This feature can be useful for digitizing boundary condition areas, property zones or your conceptual model boundary. 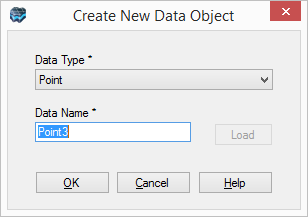 To create a new polygon, polyline or points data object, follow the steps below. •Enter a name for the Data Name field. •Click the [Ok] button to create the new data object. Once created, the new data object will appear in the Data Explorer. From here, you can define the geometry of the data object using the 2D Viewer editing tools. •Open a 2D Viewer by selecting Window from the Visual MODFLOW Flex main menu, and then clicking New 2D Window. •Next, display the data object that will be edited in the 2D Viewer. Note: You can have multiple data objects displayed in the viewer while you’re editing/drawing the data object. However, make sure that the data object being edited is the “active” one by selecting the data object name from the Layer combo box, located at the bottom of the 2D Viewer window. •From the 2D Viewer sidebar, select the Pick button to set the 2D Viewer to pick mode. Pick mode allows you to click and select individual shape elements, e.g., vertices, line segments, features, that comprise the active data object. •From the 2D Viewer sidebar, select the Edit button to set the 2D Viewer to edit mode. Once this button is selected, a set of editing buttons will display in the 2D Viewer sidebar. The edit buttons that show in the sidebar will vary depending on which type of data object is being edited. For example, the Add Points button will not be shown when you are editing/creating a polygon or polyline data object. The edit buttons are described below. Add Points: Digitize points in the 2D Viewer by moving the mouse cursor to the desired location and clicking the left mouse button. This button only shows when creating/edit a Points data object. Add Polyline: Digitize a polyline in the 2D Viewer. Click the left-mouse to start the line, and then left-click to insert a vertex along the line path. Double-click to end the polyline. This button only shows when creating/editing a Polyline data object. Add Polygon: Digitize a polygon in the 2D Viewer. Click the left-mouse button to start the polygon. Each successive left mouse-click will insert a vertex. Double-click to close the polygon..
Move Points: Move a point by selecting and dragging the points to a new location in the 2D Viewer. Rescale: Select a shape element and stretch or shrink the geometry by selecting and dragging a side or corner of the blue box. Rotate: Select a shape element and rotate the geometry clockwise or anti-clockwise by selecting and holding the blue box, while moving the mouse. Delete Shape: Delete the selected shape. Undo All: Undo all edits. This button will revert the data object back to its original geometry. If you are editing an existing polyline or polygon data object, the Selector combo box located at the bottom of the 2D Viewer allows you to select and modify the points (vertices) that comprise the features in the data object. For example, if you are editing a polyline data object, you can select Points from the Selector combo box, and each vertex that comprises each polyline will become active, allowing you to add, move or delete the vertices. When the Selector combo box is set to Points, the following icons are added to the 2D Viewer sidebar. Add Vertex: Add a vertex to a polyline or polygon feature by placing your mouse in the desired location on the line or polygon boundary, and clicking the left mouse button. Move Vertex: Select and hold the left mouse button and move the vertex to a new location the line or polygon boundary. Delete Vertex: When selected, select a vertex to remove from a line and or polygon boundary. Once you have created/modified the data object geometry using the edit tools described above, click the End Edit button to save the changes. Finally, click the View button to return to the normal 2D Viewing mode.